VERY FINE. 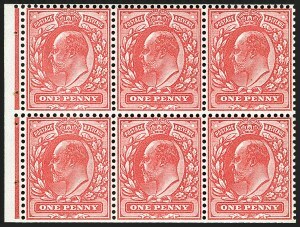 AN IMPRESSIVE AND HANDSOME CORNER-MARGIN BLOCK OF THE ONE-POUND KING EDWARD VII HIGH VALUE. 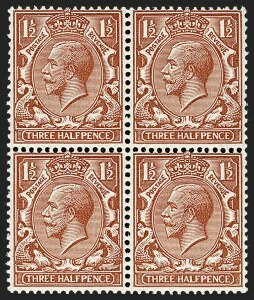 SELDOM OFFERED IN MULTIPLES. Ex Dale and Baillie. SG £10,000. EXTREMELY FINE. 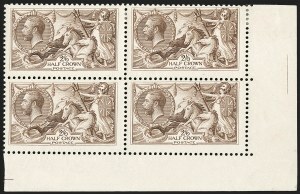 A SUPERB AND CENTERED BLOCK OF THE ONE-POUND SEAHORSE FROM THE WATERLOW PRINTING. A RARE MULTIPLE. Ex Baillie. SG as singles £16,600. 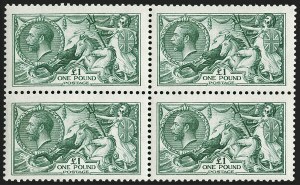 EXTREMELY FINE SET OF BLOCKS OF THE DESIRABLE KING GEORGE V SEAHORSES FROM THE WATERLOW PRINTING. Ex Barton. 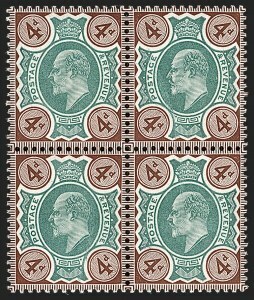 SG as singles £4,105. VERY FINE. 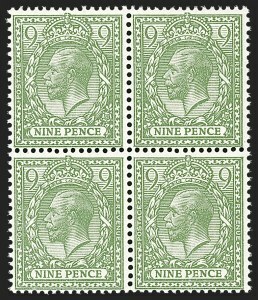 ONE OF THE MOST POPULAR AND ICONIC BRITISH 20TH CENTURY COLOR ERRORS. PARTICULARLY SCARCE IN NEVER-HINGED CONDITION. It was thought for many years that this was technically a color trial that was accidentally released into circulation. 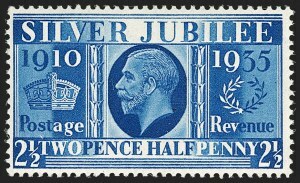 That theory has since been proven wrong, as the stamps were printed in a slightly larger size, indicating that this is a true error of color. 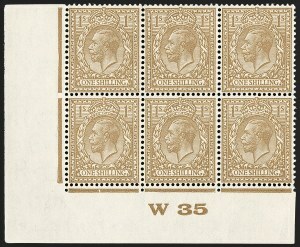 Four sheets of this error were released between June 25 and July 4, 1935, three of which are known to have originated at the Upper Edmonton Post Office, totaling 480 stamps. The original discoverer is thought to have used many of them on mail as souvenirs to friends and colleagues. 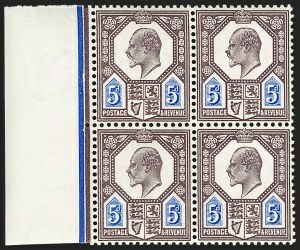 It is believed that less than half of those issued are still in existence. Ex Baillie. With 2005 B.P.A. certificate. SG £18,500. Scott $18,500.00.